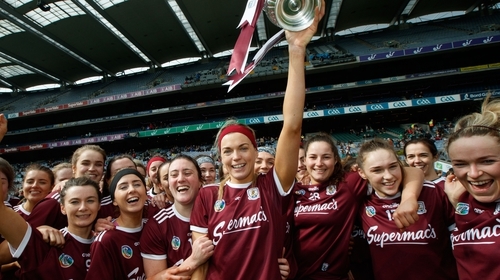 On Sunday, 31 March, Galway camogie again found its voice when holding off the challenge of the four-in-a-row-seeking Kilkenny in the Littlewoods Ireland Camogie League Division 1 Final. In the end, the Connacht side ran out two-point winners and for captain Sarah Dervan the success marked a key point in the side's development, in that it went a long way to banish doubt's about the ability within the group. A week or so later and Dervan is back at Croke Park for the 2019 Kellogg’s GAA Cul Camps Campaign Launch. Reflecting on the win over the Black and Amber, she told RTÉ Sport: "It was great, because they beat us three times last year, in league, championship and the All-Ireland semi-final. "It was huge for ourselves as players because we had the mindset, ‘Oh God, it’s Kilkenny’. Now we can go, ‘Look, we can bring it to the best of them on any given day’, provided we go out and hurl and that’s what we did in the first half. The second half, we’ll take a lot of learnings. "The goals we conceded (two in the second half) weren’t unbelievable goals. They were probably sloppy. That’s something we’ll have to address and that’s something we’ll take going into the first round of championship which is against Kilkenny." However, with the summer battles to come, Galway can feel they are on the right track, with Dervan keen to praise manager Cathal Murray and his backroom team. "Thankfully the set-up we have now is unbelievable," she added. "The management team have camogie as their life. They demand the best from us, which is huge. We probably react well to that. Cathal is coming back from being involved in men’s hurling teams and has brought that standard that we need to match. They demand the absolute best from us. And now we get fed after trainings, we have our own strength and conditioning coach. "Getting fed is definitely a new one for us. The strength and conditioning is massive. "It’s kind of crept in in the last couple of years but having a base and a structure and a programme that we all have to follow is brilliant. We’re getting treated the best we’ve ever got treated, we can’t ask for much more of the management set-up. They live, breathe and eat camogie. When they do that, we feed off it. "We have our own gym that we’re in and out of anytime we want. All,these things are massive for us, and for women in sport that we can be treated just like the guys and that’s how we’re responding." With better structures now in place, the Mullagh crucially points to that change of mindset from within that ultimately saw her and colleagues claim silverware just under a fortnight ago. "We took the league as it came. We kind of just worked on getting our confidence up and believing in our own ability which is something we’ve probably doubted for a long time. "We know we have some of the best camogie players in the country on our team. We probably just weren’t showcasing it at the critical times of the year. "Winning a league final is a great boost for us."